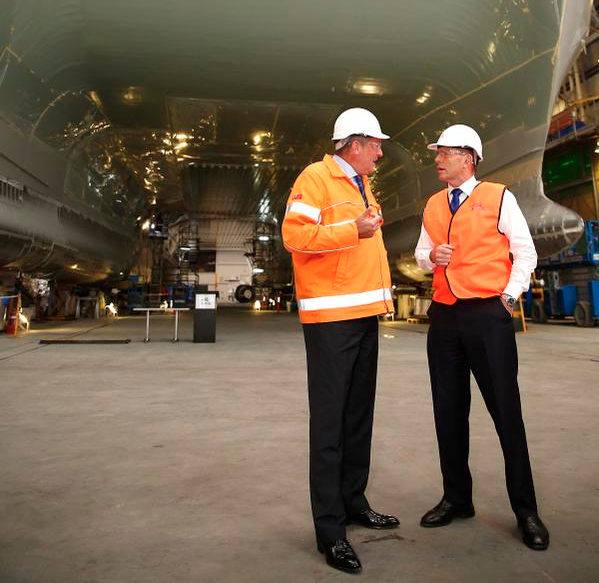 Australian Prime Minister Tony Abbott visited Austal’s Western Australian Shipyard on Friday in a tour that included the inspection of the construction of two Corvette-sized High Speed Support Vessels for the Royal Navy of Oman. The visit comes after the Government’s recent announcement of a continuous shipbuilding program, which Austal’s CEO Andre Bellamy branded as a “transformative change for the sustainability of Australia’s naval shipbuilding industry”. “As Australia’s only global defence prime contractor, with a strong domestic and international track record of success in delivering multiple naval vessel programs on time and within budget, Austal eagerly awaits the Competitive Evaluation Process – for both the Future Frigates and Offshore Patrol Vessels – and welcomes the opportunity to demonstrate the company’s competitiveness,” Mr Bellamy said. Premier Abbott, who was accompanied by special guests WA Liberal Senator Linda Reynolds, Luke Simpkins MP and Commodore Peter Lockwood, was acquainted with the numerous export vessel programs Austal has delivered over a period of more than 25 years, including the Frigate-sized 127m Littoral Combat Ship and the 103m Joint High Speed Vessel programs for the US Navy. He was also informed that Austal has submitted a proposal for the Pacific Patrol Boat Replacement Program, which will see 21 patrol boats designed, built and sustained for Pacific Island nations from 2017. Austal is a global defence prime contractor and a designer and manufacturer of defence and commercial ships for Governments, Navies and Ferry operators around the world. The company also has expertise in integrating complex systems into its ships – including ride control, ship management, communication, sensors and weapon systems – and provides a wide range of support services such as through life support, integrated logistics support, vessel sustainment and systems support.